Every community has it's stories of the dark and shocking things that people sometimes do. 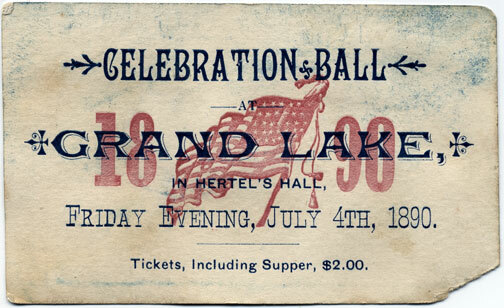 July 4, 1883 was a tragic day of unprecedented magnitude in the history of Grand County. 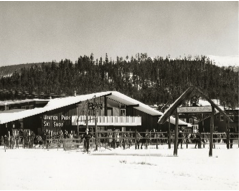 The booming mine town of Grand Lake had managed to move the county seat from Hot Sulphur Springs a year earlier and there was growing animosity between the “lake” and “springs” residents. On that fateful day, County Commissioners Barney Day and Edward P. Weber, supporters of Hot Sulphur Springs as the County Seat, had breakfasted with County Clerk Thomas J. Dean. As the three left the hotel beside the lake, they were ambushed by four masked men. After the smoke cleared, it was determined that the perpetrators were John Mills (the 3rd County Commissioner), Sheriff Charles Royer, Undersheriff William Redman and his brother, Mann. Day died instantly, Weber died the next morning, and Dean died from infection on July 17th. But Day fired back back, killing one of the masked assailants, who later turned out to be Commissioner Mills. The other three escaped. The sheriff and undersheriff had quickly returned to Hot Sulphur Springs and shortly after, they were sent for to investigate the very crime they, themselves had committed! Sheriff Royer shot himself on the night of the 15th and his body was discovered the next day. Dean later testified that Mills shot Weber, Redman shot Dean, Day shot Mills and Readman and Royer shot Day. Undersheriff Redman disappeared shortly thereafter, apparently shot. A body was found later on the Utah border thought to be Redman but there was no positive ID. The body was suspected to be Redman from the size of his feet. Whether he killed himself or was murdered was never determined, but nonetheless, if it was Redman, he was the sixth victim of the Grand Lake Commissioner shoot-out. It is interesting to note that all three commissioners killed had been appointed to office rather than elected. Ironically, the county seat was moved back to Hot Sulphur Springs several years later. Robert Black. Island in the Rockies, Pruett Publishing, Boulderm CO 1969. 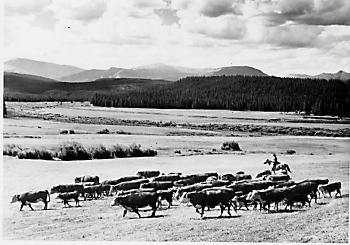 The Depression of the 1930's had its effect all over the United States even to the remote ranches in Colorado. 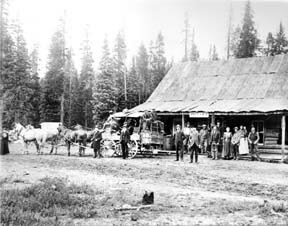 Although it would be difficult to prove that the hardships from the Depression had a bearing on the New Year's Eve killing near Radium Springs the uncertainties of the time were a constant worry for everyone and often caused short tempers and heavy drinking in spite of the prohibition laws. which was, and still is the direct route from Kremmling to State Bridge. Breitinger was known as "Good Eye Bill." It was rumored that he lost the other eye to a shot glass thrown at him in a Kremmling bar fight. Good Eye was visited by three area loggers around noon on that New Year's Eve. They were Joe Penna, Clarence Reiff and a fellow named Van Pelt. He invited them to lunch. They spent some time chatting and drinking Good Eye's special brew made from rhubarb. Archie Davis rode up on horseback and appeared at the door. Good Eye told his visitors he didn't want Davis in the house but that didn't stop Davis. He entered uninvited with a bottle in hand, which contained spirits. Davis offered a shot to the visitors, which they accepted, but Good Eye refused to drink with him. The three visitors left and headed for the nearby forest and Good Eye asked Davis to leave. There was a history of bad feelings between the two. Maybe Davis was trying to make up with his neighbor and he again offered Good Eye a drink. The spirits likely came from Archie Davis' two brothers, Barney and Clint who were reported to be bootleggers. Even though Good Eye continued to refuse the offer, Davis finished the bottle, went to the horse saddle, got another bottle and mounted his horse. Good Eye thought he was rid of him but a moment later he was shaken by rifle fire. Bullets were ricocheting through out the cabin, hitting coffee cans in the attic and bouncing off the cast iron stove. In fear for his life, Good Eye grabbed his 10-gauge shotgun just as one of the rifle bullets went down one barrel exiting just above the trigger. Then Davis again shot through the door and kicked it in. Good Eye Bill pulled the trigger on the good barrel later the other barrel misfired. Archie Davis was blown out of the doorway and dead before he hit the ground. The loggers returned to the cabin and noticed that Good Eye had a bloody arm. He described what had happened and pointed to the body. Penna suggested they take Good Eye to town and advise the Sheriff. An area sheep rancher, William Foley, was passing by with his flock and saw Davis' body. He stayed with the others until Sheriff Mark Fletcher arrived on the scene. It took Fletcher 9 hours by horse and car to investigate the shooting and get Good Eye to jail in Hot Sulphur Springs. The Coroner, Cliff Efmoil was advised. He called for an inquest jury to be held the next day, New Year's Day. Good Eye Bill did not have a good night in jail. He repeated his claim that the shooting was self-defense. The inquest was held. Along with the loggers, Foley and Sheriff Fletcher, witnesses included Good Eye's friend, Charlie Free who went to the cabin New Year's Eve and again New Year's Day looking for shell casings. These were presented at the Inquest. The Jurors included Jesse Norris, sheepherder, Horace Brown, shop keeper, Carl Breeze, bank employee, Frank Jones, rancher, Guy Dillingham, a quiet fellow who was appointed chairman of the jury. Good Eye Bill was acquitted in short order but the episode caused Bill to leave the area. He said he was too afraid to live on the homestead. 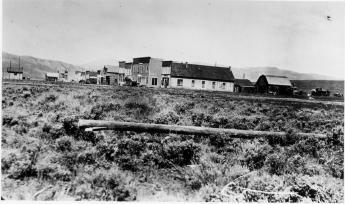 Charlie Free, son-in-law of the famous Grand County Sheriff, Solomon Jones, bought the property. To this day there is a sign over the entrance road reading "Good Eye Bill." The cabin which was partly built into the hillside is still there and the spring still flows. The summer of 1933 offered more excitement than usual. First there was a lost child who kept most of the Fraser Valley busy searching for several days. Just two days later, the town of Kremmling was visited by two criminals who came to rob the local bank. Bank heists at gunpoint were becoming a popular form of crime thanks to men like John Dillinger and Baby Face Nelson. This particular hold-up would be Grand County's first experience with the phenomenon. A short time before noon on August 29, two men came into the Bank of Kremmling, with pistols drawn. On entering, they walked to the cashier's office, which was separated from the lobby by a waist high wall. Three men, bank president F. C. Jones, cashier Carl G. Breeze and a customer, were in the office at the time. They were held at gunpoint by one robber while the other went to the teller's cage, which was occupied by Mrs. Ethel Hackwith, assistant cashier. The robber forced Mrs. Hackwith to turn over all the money in the cage and then demanded that she open the bank vault. "I can't," she said. "The door is on a time lock and won't open until an hour from now." Discouraged, the two men decided to leave. They forced the teller to accompany them and commandeered her car for use in their getaway. They had collected only $1770.74. In fact, the vault had not been locked and the door could have been opened with a simple push. Ethel Hackwith's quick thinking had saved the bank some $5,000, and she became an instant heroine with her picture on the front page of the Denver Post. The robbers had overlooked a second source of loot when a second customer had entered the bank with a handful of cash that he was expecting to deposit. He was not robbed but was simply forced to stand quietly until the culprits left. He was reported to have said: "I was never so insulted in my life. You'd think my money was no good." The president of the bank notified Sheriff Fletcher as soon as the robbers and Hackwith were gone. Several carloads of Kremmling citizens along with the town deputy set out in pursuit of the crooks within 15 minutes. The trail led south over the river toward Dillon. The pursuers almost immediately found Mrs. Hackwith where the robbers had dropped her off and then proceeded on with her car. 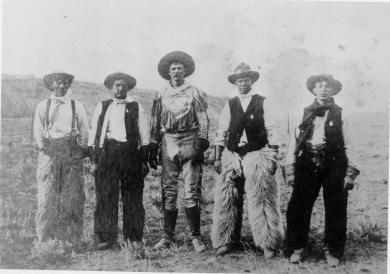 Kremmling Bandits Trapped High in Hills and Gun Battle Imminent"
A ridiculous article followed that described the posse as being composed of pioneers of the region, all of whom were "used to the two-gun method of gun-fighting" and were "dead shots with a rifle." The car was found and later one robber was apprehended by Sheriff Mark Fletcher, tried, convicted and sentenced to 12 to 20 years in the penitentiary. The second robber was picked up in Wyoming on suspicion of robbing a post office in Verse, Wyo., a month or so before the Kremmling job. He was sentenced to a three-year term in a federal prison. - The above is a short version of the Kremmling Bank robbery in 1933. For the entire story and other accounts of the tenure of Mark Fletcher as Sheriff of Grand County from 1924 to 1944, read "A Western Sheriff, The Biography of Mark Fletcher" by Robert Peterson & Elsie Fletcher Ruske, available at the Grand County/Pioneer Village Museum. 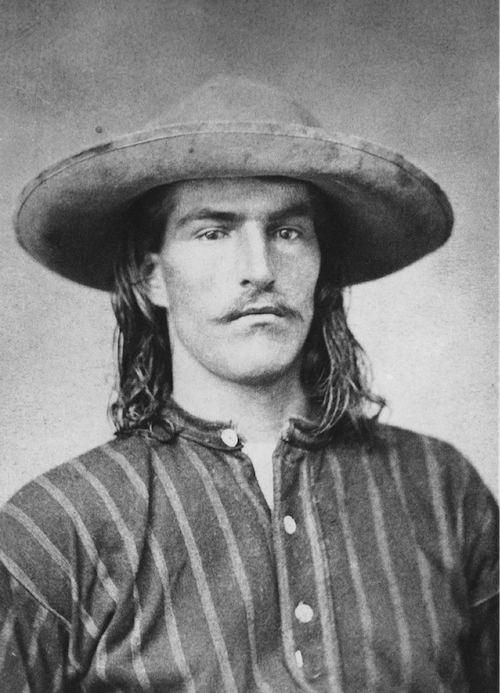 Charles Wilson, a punk nineteen year old, came to Grand County in 1883. he called himself "Texas Charlie", and always wore a sombrero. He was infatuated with the literature of tough outlaws and with his flamboyant style, he attracted two other cronies into a small gang of bullies. 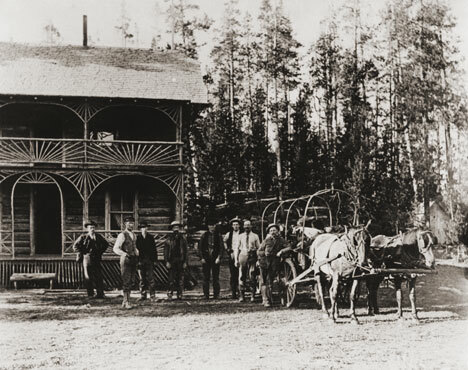 One day in early December, 1883 the gang invaded a saloon in Hot Sulphur Springs and threatened the life of the barkeeper, then went to a general store and pistol-whipped a randomly chosen customer. Threatened with arrest, Charlie challenged the local constable by tearing up the warrant. The hoodlums left town but chose to return on December 9th. They dismounted at the Justice of the Peace office and drew their pistols. Suddenly, Charlie's revolver was shot out of his right hand and his buddies pulled back. When the kid from Texas picked up his weapon with his left hand, he was gunned down by fire from many directions and finally lay dead in the dust. A post-mortem investigation was held and everyone admitted hearing gunfire and seeing the body, but no one knew which of the "leading citizens" of the town had fired. The jury returned the verdict: "We find that said C.W. Wilson came to his own death by gunshot wounds at the hands of some person or persons to us unknown". His partners had left town and were never seen again in Hot Sulphur Springs. The kid from Texas was buried on a hill in an unknown spot rather than in the town cemetery. I work in Cultural Resource Management (CRM), which means I document any man-made occurrence that is 50 years or older. I’ve recorded anything from prehistoric stone tools to 1940’s cans and glass. As a CRM archaeologist, I’m a data collector. Our job is to protect the archaeological record by gathering data and determining the significance of it. In 2011, I worked on a project near Jensen, Utah, just across the border from Colorado. During this project, I came across an unmarked grave. There was a headstone, but no name. I eventually found from historical documentation that the grave was that of a man named William Redman. Redman was the undersheriff who took part in the Grand County Shooting of 1883 that involved three county commissioners, a county clerk, and the sheriff. Three men died during the shootout, two men died of their injuries after the fact, and the sheriff committed suicide out of guilt. Two weeks after the incident, Redman was the only living participant. He was on the run from the law and actively hunted by the Rocky Mountain Detective Association. A full month after the shootout, Redman was found dead in Utah at the side of a road with a bullet in his head. I knew Redman was part of the Grand County Shooting and poured over any sources I could get my hands on; books, websites, newspaper articles; any tidbits of information that might answer questions. Like a detective, I wanted to understand how Bill Redman was involved in the gunfight and how he ended up in Utah. I found the story and a picture of William Redman and I was ecstatic that a site I had recorded was associated with such a tale. William Redman was ruggedly handsome with high cheek bones and pronounced jaw; the clothes and countenance of a miner. The more I learned about him, the more questions I had. How old was he when the photo was taken? At a time when it was such a privilege to have a photo taken, why is there a photo of him and not other prominent men in the county? I wondered about his motivations. Was he the ruffian newspaper articles touted him to be? Archaeology is about understanding the past. Most of the time we are forced to interpret the past with only a few pieces of material that are left behind. The more material and data we have, the more we can understand. In the case of William Redman, there are questions surrounding his death that give rise to the possibility that the man in the grave is not Redman at all. If the opportunity arises to excavate the grave, his photograph will assist in his identification. Archaeology not only studies the past but works to preserve the past for the future. Now, I hope that a family member of yours is never being researched by an archaeologist for being a ruffian and a murderer. But, like an archaeologist, I would encourage you to preserve as much as possible for those in the future who would care to learn about the past. George Henry Church and his brother John had a substantial ranch in Jefferson Country, prior to Colorado Statehood. When the Timber and Stone Act of 1878 was passed, it permitted the purchase of land unfit for agriculture for $2.50 an acre. Thus the Church brothers obtained land in Middle Park for summer grazing. 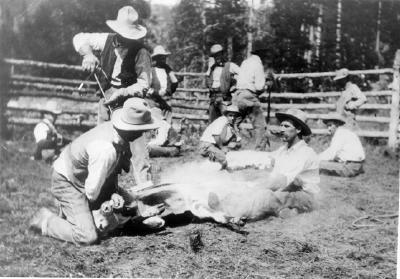 They would move their cattle into the Park by driving them over the Rollins Pass. 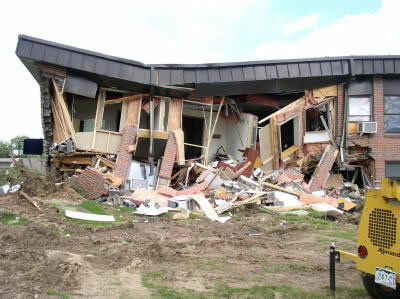 The area they used is just west of the town of Fraser and became known as Church Park. In 1910, the Church Ditch was created to divert water across the Continental Divide for irrigation. The remains of this early trans-mountain project can still be seen today at mile marker 241.5 on U.S. Highway 40. Before the invention of seeding machines, a farmer or rancher would walk across his field in a straight line carrying a bucket or sack of seed with one hand. With his other hand he would fling fistfuls of fertile grain in a wide arc in front of his path. On reaching the end of the field, he would refill his bag, move over a few yards and repeat the process on the way back. After hours of walking and the casting of numerous sacks of seed, one handful at a time, the field would be planted. I guess I was about 13 or maybe 14 when my father decided to plant timothy and clover on the east half of the meadow on the mesa. The area to be planted was probably forty acres or more that the ranch had leased to a Hindu man to grow lettuce and other truck crops. For several years we had gotten free lettuce for our table and our milk cows had loved the turnips from his harvest that were either too big or too small to be sold. I guess the profits from his work weren’t very good and the risk of growing lettuce in the rainy valley was too high. The Hindu had abandoned his lease and we would now put the water and the land to our own good use. Since we had no seeding equipment, we would broadcast the seed by hand. It would take hundreds of pounds of it to do the forty acres. I was eager to help. Dad looked skeptical but finally agreed to let me try. After a bit of instruction he sent me off across the field. “Remember,” he had said. “You have to spread it even and don’t miss any spots.” I soon developed some regrets about volunteering. Not only did we have to plant the field once, but we had to plant it a second time as well. It seems that a planting of timothy and clover grows only a few inches high the first year and doesn’t produce a harvest. In order to avoid losing an entire season, it was customary to plant a second crop on top of it. In our case, Dad had chosen oats for the second planting. This choice would produce lots of feed right away even though the growing season in the Fraser Valley was too short to yield any grain. We planted the hay crop on one day and the oats the next. I was exhausted by the time we had finished. In fact, if memory serves me right, Dad did the last five or ten acres by himself. When fall came, we had oats four feet high. They were cut, stacked like hay and fed out the following winter. The year after, there was beautiful timothy and clover that has continued to produce a fine crop for more than 60 years. When I visit friends on Ranch Creek every August, I drive by our field both coming and going. Each time I see it, I remember my work and experience a sense of joy and accomplishment. All the things I produced over a professional career of nearly 40 years are now obsolete but the timothy and clover seeds planted so long ago are still growing. 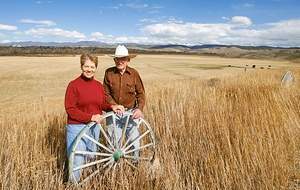 They will continue to do so until the Hurd Creek Ranch sells its water right and the field dries up. In our modern world, a 40-acre field of timothy and clover isn’t much. But how often, today, does a teen-ager have the opportunity to do work that will serve for a lifetime? The above material is copyrighted by the author, Robert K. Peterson. Reproduction is any form is limited to the personal use of the view and/or to educational purposes. Neither the sale of nor any other commercial use of the text or illustrations is authorized. Washington Irving wrote "There is, perhaps, no class of men on the face of the Earth who lead a life of more continued exertion, peril and excitement, and who are more enamored of their occupations, than the free trappers of the West". The diet of the mountain men at times consisted of nothing more than meat. When possible. wild plants and berries supplemented needed vitamins. Pemmican, a meat pounded with fruits and dried in flakes, was convenient to carry and lasted a long time. Mountain men made boudins, sausage made from the intestines of newly killed animals. These sausages were packed full of undigested grasses which probably protected the mountain men from the illness of scurvy. The mountain men also chewed on leaves and wild grasses to supplement their vitamin needs. Potatoes soaked in vinegar supplied further balance to the diet. Jams and orange marmalade were highly valued whenever they could be obtained. Bread consisted almost entirely of hardtack, a touch cracker usually unsalted, which would not spoil and sturdy enough not to crumble. Beaver tail soup was considered a delicacy by most mountain men. Another treat was called "French dumplings", made by mincing buffalo hump with marrow, rolling it into balls, and covering with flour dough and boiled. Coffee was popular, but limited for transport. Tea from China came in solid blocks which could be shaved off as needed. Normally, mountain men could not carry whiskey on the move but at rendezvous or during visits to forts, they were known as fabulous drinkers. The most common intoxicant in those days was "Taos Lightening", a strong whiskey manufactured by Simeon Truly of Taos New Mexico. Various writers have portrayed these men as brutes who lived from one drunken episode to the next, but the facts, and common sense contradict that image. They could not achieve much in either trapping or trading if they did not stay focused on their outdoor skills and survival. Smoking pipes was a luxury, mostly at nights as only a limited amount of tobacco could be obtained. The mountain men would stretch their tobacco supplies by mixing it with kinnick-kinnick and other plants. While many traders and trappers dressed in buckskin shirts and trousers, wool garments were even more common and needed to be shrunk to fit. Probably every mountain man carried what was called a "possibilities bag" that contained personal items such as a pipe, tobacco, soap, needles, and small keepsakes such as mouth-harps. Before the Sharps "Big 50" rifle was invented, it was necessary to carry a waterproof powder horn and a bag of rifle balls weighing fifty to a pound. A good knife was essential. The most sought after of these was the Bowie Knife, invented by Rezin Bowie, but made famous by his brother Jim, who was adept at its use. Jim was one of the heros killed at the Battle of the Alamo in Texas. 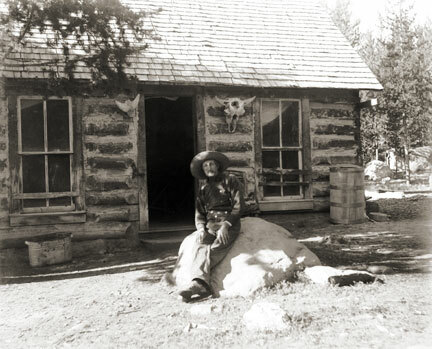 Some mountain men simply loved the lifestyle and had no reason to return to their original homes. 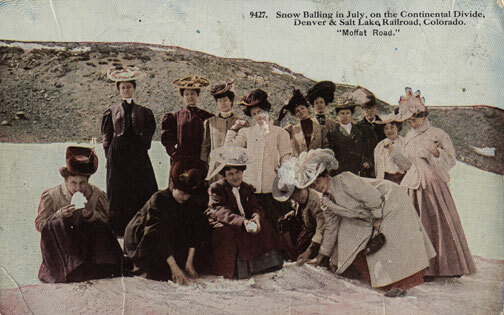 Some had wives back in St. Louis and made an annual trek there every year. Others had Indian wives or female companions. Some men claimed to have a wife in every tribe they visited. Divorce within many tribes was often simple, a matter of putting one's belongings outside the lodge. As journeys by foot or horse were lonely, mountain men were known to play their mouth harps or sing songs along the trail. The use of profanity was common, except in the presence of white ladies. One writer claimed the Indians called white men "Godams" because that swear word was used so frequently by the mountain men, ranch hands and mule skinners.